I try harder that most I know to park my own car here in L.A. Playing Tetris in a crowded strip mall lot? Easy. Curb spot with a two-hour limit? Nice — I’d even take half that time. I’ll gladly validate for a garage or dig out some quarters for a meter. If I don’t like the prospects for where I’m headed, I can save myself the headache and Lyft right over. What I desperately want to avoid, at all costs, is a supposed luxury: valet parking. People have all kinds of reasons for avoiding the valet stand. Some have worked the job before and no longer trust anyone who does, while others have heard (or lived) a valet horror story. Maybe it’s plain thriftiness, and while I could always stand to save a couple bucks, that’s not the primary issue for me. What I find most stressful is the knowledge that the valet is going to roast my fucked-up car. It’s a virtual guarantee. I drive a 2014 Volkswagen Jetta that I named “Corey” because nothing else felt dweeby enough to convey its personality. So it’s not like I’m worried that a teen in a vest who works outside a steakhouse is going to take it for a joyride. 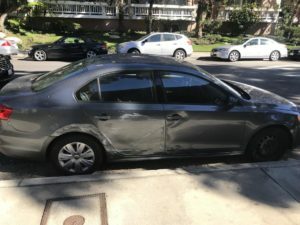 What does concern me is that he’ll have to point out the significant scratching and dents (multiple failed attempts to get out of the very narrow driveway at my old apartment), the cracked side mirror (unspecified accident my ex-wife had before I took the car in the separation), and maybe the missing hubcap on the front right wheel (it was just gone one day). This is to prevent me from later blaming them for the damage, which I understand, but there’s no way to make it a comfortable exchange. That’s why they try to turn it into a joke. Valet guy made fun of the godzilla sticker on my car. And the reindeer nose. Anteaters are gonna ant. Usually I get some version of “My god, what HAPPENED?” A couple of guys have treated me as if I’m arriving from the scene of a nasty hit-and-run. One generously supposed I had been oblivious to Corey’s battle scars — “Did you, uh, notice this here?” he asked with a chuckle. And this is all before they climbed in to realize that my Jetta doubles as a repository for 200 empty La Croix cans, with a few Big Gulps tossed in for good measure. There’s a 50-50 chance I also recently farted in there. The sickest burn of all, though, was when a valet asked if I’d learned to drive on this car. Ha ha. Very funny, dudes. Catch me circling the blocks in ever-expanding circles until I finally park a mile and a half away. That’s how sensitive I am. Corey runs fine! I took him all the way up to Oregon and back this summer — twice! And I don’t particularly want to pay thousands of dollars for the cosmetic surgery he needs to conform to your unrealistic standards of automotive beauty. He’s a good, reliable, practical car, and he doesn’t deserve ridicule. He simply wants to ride around and listen to podcasts. David Lynch just made fun of my car as the valet pulled up. Hollywood, I've arrived. Yeah, I’m gonna start walking more.